this nut is nothing, i have used force with this plier. I would like to make one more page about the pliers used on the SwissTools. 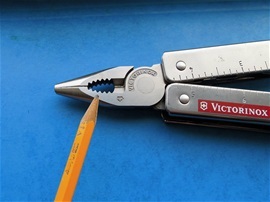 The information about the reason for why Victorinox reversed the pivot on the plier head can be found on the internet. 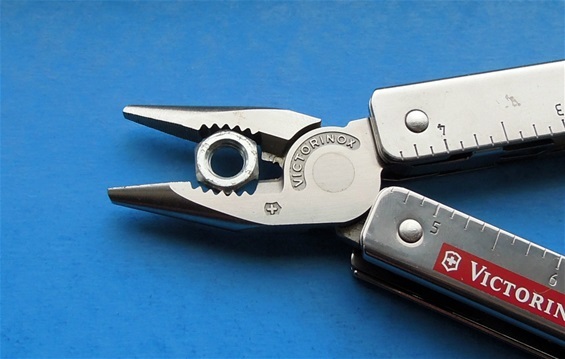 If you read my page under SwissTool and the plier page I did mention that the Company did some modifications on the pliers because of the forces working on them in motion. I believe it is easy to understand with the clockwise and counter clockwise forces. 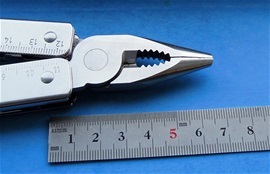 It is not so that the 1998 type plier got any defects. It is because of Victorinox and their constant quality improvement that this is done. In 2002 the pivot was reversed. This does not mean that the 1998 introduced pliers were stopped because many SwissTools was made with the 1998 type plier after 2002. I do believe it is at least six modifications on them from 1997 until today. The most important part when turning a bolt is to have a sturdy grip and motion. The force applied when turning should be in a line without twisting at the same time. Push and pull in a straight line. The 1998 type plier is one of the types I have seen the most and it is for certain one of the best. Please read my pages because they are all conected. A balanced plier will respond to the force applied to the handles and transfer it onto the surface you use it on. If a plier is not balanced in the design then it will not apply the according pressure from your hand towards a surface. A balanced plier must be able to apply the pressure with a stabile construction so the pressure will not distribute elsewhere. When applying the correct motion and pressure on the handles and plier then it can be used to turn a device rather well. Remember that if you do not use the correct motion together with the pressure then the nut or bolt may slip and disturb the correct motion. In my research I did discover that sometimes a nut or a bolt may be damaged or the plier may cause damage upon the equipment. This may be unavoidable sometimes no matter how you use the tool. Sometimes it is necessary to use both hands when using the plier turning a device because the nut or bolt is close to a flat surface that would make it difficult to get a grip with the hand without scratching the fingers badly. Then it is possible to some extent to use two hands or the fingers on two hands to squeeze and apply stability on the narrow part of the handles but it is not comfortable. This is why I discuss so much about combination tools. This can be small tools or devices that can be used in combination with a plier. The possibility to use different keys may be smart to avoid damage on equipment. It is also necessary to use two tools sometimes because of different equipment. Some nuts or bolts must be held on one side and turned on the other at the same time! It is difficult to make any evolution to avoid the issues mentioned above but have in mind that different hex ratchet keys can be turned with a plier so you get some distance from the surface. With the SwissTools it is possible to bend things that are much tougher than this nail. It is possible to bend round steel with the tip or front section. This may mean that one must bend sideways. The needle nose design get in trouble doing so because the jaws can be bend apart so much that they may get damaged. For sure you can bend thing with needle nose designs too but they cannot compare to the hybrid design. There may always be some sideways flexing on most pliers, it just when they get bend apart too much that damage may happen. Also have in mind that the rivet design and the flexibility from the tip all the way back to the rivet will influence this. There is one thing that you should know and this is using a needle nose design bending sideways that you must be aware that if you bend something round that a needle nose may slip at one point when they flex or get bend to much apart. This is because the flat section or grip area in the front get bend out of grip. It is very important that you use a firm grip and you do not let go of the pressure towards the handles when bending. I feel that the hybrid design used by Victorinox deserves to be called an evolution on multi-tool pliers! A plier is not a new invention and this I have discussed some from time to time. There is an evolution no matter what and that is the multi-tool plier today. This is because it is a tool that can fit the modern world. It is a plier designed to be a multi-tool in itself and an extension of the human hand to be used with a versatile mind. One major important factor is the cut section of the plier with the opening. There are different names for this and it can be called many things. What is important is that there is an evolution on this as well on the SwissTool plier. Again this is from what I believe to be the constant quality improving. It is not so that it is a defect in the design it is just to improve the already good product. A multi-tool plier should be able to grab a surface that would be impossible for the human hand to turn. This can be a metal tube or rod. The cut teeth should be able to grab and turn it. The SwissTool can without a doubt turn pretty hard on a completely polished metal surface. This alone is a factor to know. A balanced plier must be able to have a cut section that can enclose a round device with pressure that can hold alone and that the cut section also can sink microscopic into the surface and be able to get a better grip. These two factors are important! The cut section takes advantage of edges. This is the biggest advantage with a multi-tool plier. It can be used to hold a bit adapter, bits and keys. The advantage with this is many. It can be used to avoid damage on equipment, nuts and bolts and it can be used to get a distance from equipment so you avoid cutting the fingers. The cut section at the opening can be just for much more than I have mentioned so far. This section can be used for crimping tasks that will secure a set crimping to some extent. 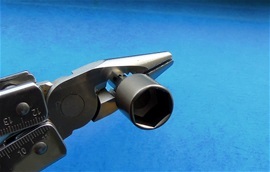 The tip section can be used for crimping on eye measure and hand pressure. The opening can be used for holding task to avoid damage on the hand or to hold wire. Because of the design it is possible to do this with control. I do believe no matter what theory that a short plier with solid dimensions are the best for the strength and force that can apply on a surface. This depending on the handle as well that sad. To compensate for a longer plier then one would have to make the handle longer as well one would believe. But no! This will result in a construction that would flex out of the ordinary. A long plier will lose strength and force that it can apply to the surface because of the length, flexibility and the size of the plier dimensions at the front. A balanced plier should be short with long handles. The SwissTool is balanced with a rather short plier and longer handles. 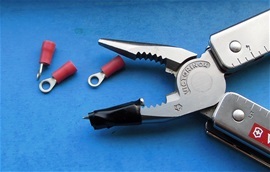 If you notice on the plier jaws when in closed mode that there is an opening that get larger inwards. This is correct and this is because the plier is balanced when you apply pressure on a surface. Because there is flexibility in the steel it will when you apply pressure on the handle become flat towards each other. This will help for gripping as well. This cannot be called an evolution maybe. It is however worth mentioning that this plier is balanced very well because it is a sturdy design. There is more material at the tip that will make the grip stronger. A longer plier with a needle nose design will not perform the same. It is not so that if you have a narrow tip or a needle nose plier that you will be able to apply more pressure on a smaller surface. This is because of the flex and long plier. It must be a shorter plier with rather long handles and a balanced dimension on the tip section. 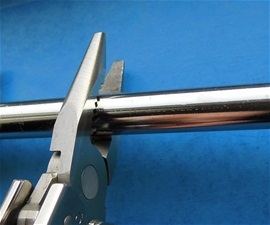 If you however attach a nail along the hybrid plier then you will be able to make more pressure on the smaller surface. You can also use different size nails for different crimping distances. The plier can be used for work on rope because the tip is rounded. This just for some extent that sad. With a multi-tool plier it is possible to improvise and this people should take advantage of. If you are in a situation that you can only reach an electrical plug with the plier then you can if you have insulation tape insulate the plier jaws in a way that it can touch a power point without danger. Insulate in a way that the tape will not slide off or you can insulate the handles. It is not recommended to do so and it depends on how tough you are and how much current you want to avoid maybe. It is not the voltage that is the danger usually but the current. Remember that this is not for the faint of heart. With gloves you can get an additional insulation. The Swisstool got such a wide jaw gap that you can use the cut center opening easy. Here you see one example on a hot device that you would need a plier for adjusting or for change. The SwissTool plier got a wider possibility than the Wenger plier. It is possible to use the tip or front section. There are different camp chores and tasks that would need a plier to be used as a grabbing or holding device. Remember proper use and prevent the plier getting so warm that the tempering will be damaged. This is usually never any problem because if you use the plier just for adjusting or grabbing then it is not enough time for the plier steel to get damaged. In the outdoors such a torch is maybe not normal but you never know today. A plier is an ancient device. A multi-tool with a plier is an evolution anyway because it is made to fit the modern world. The torch is not any device that can be turned without a plier or a key. The design and hybrid construction of the Victorinox plier is an evolution on multi-tools. I have touched some factors and aspects. One of the reasons for the shorter and sturdy front section of the plier is because it is a stronger design. It is obvious that the further towards the front you get the jaw opening are bigger. This then mean that in some situations this section is used. Sometimes a nut or a bolt is in a position that would require you to use the front section anyway. A needle nose design or a plier may get damaged by such tasks if you have to apply force turning a bolt. It is a big advantage with a shorter and sturdy tip section like I have explained around Sakhome.com. This is why it is an evolution plier. My testing of the Swisstools is over and i can give special information if needed. This has taken some years but it is there if you want. I have no need for further testing on SAKs and I hope my information is of help. It is necessary to tests a few tools and SAKs to know what I am talking about. I have shown a few pictures around Sakhome.com for guide and information. They have been tested far more that the pictures tell. It is important to know all parts of the SwissTools with all the functions, plier and construction. It is important to know use, maintenance and durability. The locking mechanism and module must also be understood. With the plier that can be divided into 3 factors are the front section with what I call the hybrid design and the pipe wrench (cut teeth for bolts and nuts) and the wire cutting areas. I have full knowledge now on all parts on the 1998 and 2002 type plier head. I have also used a 2005 type. I do not have count on how many knives included SAKs and multi-tools i have tested but it is a good number over the years. This was neccessary and i have had the luck to see a great deal of used and hard used knives over the years. This is important knowledge.